It was in 2008 that we at Momentum Christian Literature first heard about Simonetta Carr and her book. An associate of our director recommended her biography of John Calvin. It was an illustr ated book for young readers. Most of the staff of Momentum appreciated the book, but at the same time felt skeptical about publishing it in Indonesia. It was biographical and historical, the illustrations were almost naturalistic, and the photos were also mostly of “old stuff.” All were good things in themselves, but back then it was difficult to see how the book would appeal to the intended readers. Biographies and histories were (and still are) an unpopular genre, even for adults. Mangas dominated (and still dominate) the children book market in Indonesia and even Christian books had followed suit in using manga-style to increase their market. Staying true to our mission to produce good Christian books, and being under a Calvinistic church, Momentum translated and published John Calvin, the first in the series of Christian Biographies for Young Readers. We went through all the paperwork to get permission from the original publisher, Reformation Heritage Books, which was also a fairly unknown Reformed publisher for Christians in Indonesia at the time. The work went well. Then came the time to sell it. Honestly, we did not have high expectations. We had published some children and young reader books before which were more practical, had “cuter” illustrations, and their authors were relatively well-known in our Reformed circle; but still the sales were just so-so. Thus we did not know how well this first bio would do. It turned out that the book did very well indeed. Our local congregation became the first enthusiastic buyers when it was launched. It sold well in a educational seminar soon after that and also in our synodal convention at the end of that year. Was it perhaps because the book was about John Calvin and we were just “fanatical” Calvinists? The second book from the series that we translated and published in 2010 was Augustine. It also sold very well. Was it because Augustine was a familiar figure? Then John Owen came out in 2011. Owen was not as familiar a figure as Calvin and Augustine in our circle, but the book proved to be just as popular. Two other titles from the series followed. Athanasius was published in 2013 and Lady Jane Grey in 2016. Both were well-received. First, she is a perceptive story teller. We can see that she does her homework with all the historical research, and she knows how to choose what to include in the narrative, without cramming it with irrelevant information. In short, she knows how to make history come to life, not just telling about people and events that have long gone. Second, she knows who her readers are. She chooses her words and styles her sentences to suit her readers. She takes care to explain some difficult or archaic terms and describes some necessary historical circumstances and traditions to her readers. Third, she uses illustrations judiciously not gimmicky. She gives illustrations and pictures their proper place. They are to support the narrative, to give readers a clear understanding of it but not to supplant it. They are interesting but not a selling gimmick. Simonetta Carr and her works have loyal readers now in Indonesia. And they are not just young readers, but also adults! So, after all, it is not because we are fanatic of the figures she talks about. It is because she give us exceptional works as an exceptional author. We are looking forward to her future titles. 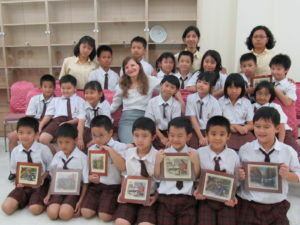 We were privileged to have Mrs. Simonetta Carr visiting us in Indonesia in 2011. She shared her thoughts at an educational seminar held by our church. Afterward her many readers had the opportunity to get their copies of Christian Biographies for Young Readers (three titles already published at the time) signed by the beloved author herself. Such a sweet moment! May God bless Simonetta Carr and her works, and, through them, also many people.